Brits registered 85,247 Fiestas in the first eight months of 2015, a figure the second-ranked Vauxhall Corsa may not match over the course of the full calendar year. Prior to the Fiesta’s nearly seven-year run, the Focus was the UK’s best-selling vehicle for a full decade. Through 2014, one Ford or another has been the best-selling vehicle in the UK in 43 consecutive years. The Ford Motor Company’s market share in the UK in 2015, sans Lincoln or any other assisting brand, is 13.1%. The Ford brand owns 14.5% of the American new vehicle market; Ford MoCo owns 15%. Four out of every ten Fords sold in the United Kingdom are Fiestas, compared with 3% in the U.S. 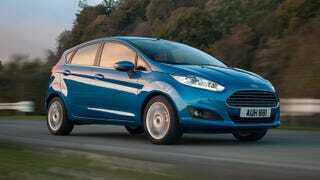 The Focus, ranked third in total UK volume, brings in another quarter of Ford UK sales. The Fiesta is America’s 33rd-best-selling car and 70th-best-selling vehicle overall. The Fiesta accounts for 9% of the Ford brand’s U.S. passenger car sales. Subcompact car sales in the United States are down 9% this year. Fiesta volume is down 3% to 46,872 units, little more than half what a much broader Fiesta range achieves in the UK, where cars of this type are, rather obviously, infinitely more popular. Ford will struggle to sell more than 60,000 Fiestas in the U.S. this year for the first time since 2012. These are the ten best-selling new vehicles in the United Kingdom during the first eight months of 2015. Total new vehicle sales are up 7% to 1,634,369 units, according to the Society Of Motor Manufacturers And Traders. We highlighted America’s best-selling cars, SUVs, trucks, vans, and premium vehicles last week.